Well, I'm back to blogging and checking everyone's blogs. It's my little escape and I miss it when I am "away". We have had no more issues with little man's eating since his surgery! Thank you to everyone that has asked. Monday we visited some family and celebrated birthdays. 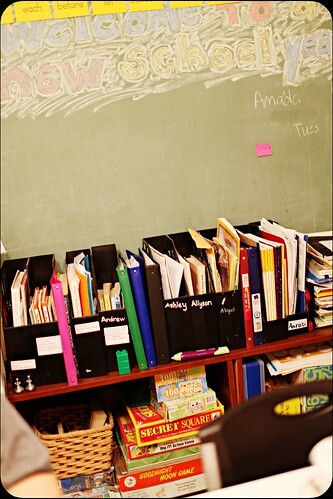 They are a homeschooling family and I loved seeing their school room. 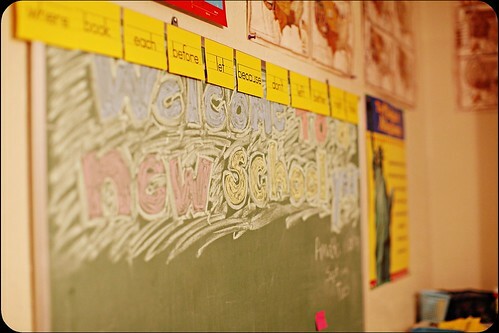 Chalk on the chalkboard, papers in boxes, their artwork proudly displayed for everyone to see and the smell of crayons. Oh, I LOVE it! I have always wanted to homeschool my children even if only for a short time. I'd love to have that memory with them! I am getting my before/after picture ready for tomorrow. How about you? I can't wait to see your art! I'm so glad to hear he's doing well! YAY! Good to see that little Man is doing well! I wish I could home school my little on but somebodies gotta bring home the bacon! Praise God that your little man is doing well!! There is nothing like homeschooling. I absolutely love it! I'm glad that Little Man is doing well! Nice pictures of the homeschool room! I plan on homeschooling my son for at least Elementary school. :-) Looking forward to it! Hooray! Glad to hear little man is doing well! We were on a hiatis too...my littlest one is crazy sick- combined w/ a new allergy to penacillin...not fun.